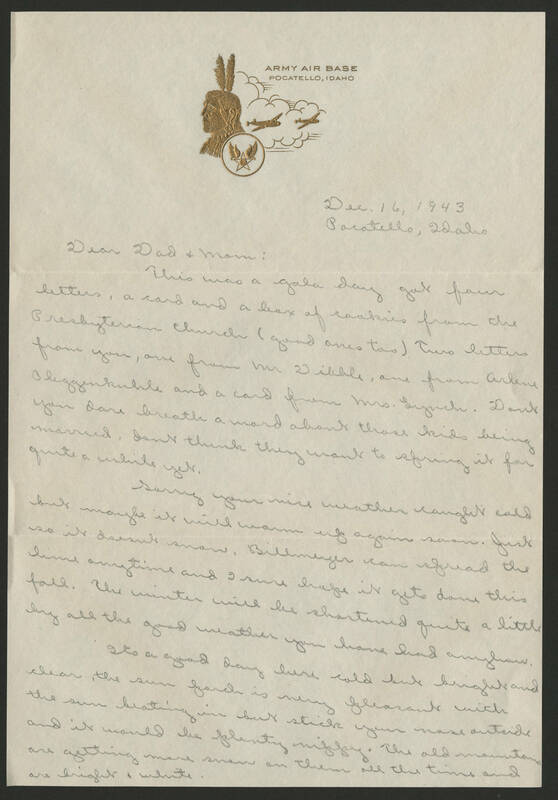 Dec. 16, 1943 Pocatello, Idaho Dear Dad & Mom: This was a gala day got four letters, a card and a box of cookies from the Presbyterian Church (good ones too) two letters from you, one from Mr Dibble, one from Arlene Oleggenkuhle and a card from Mrs. Lynch. Dont you dare breath a word about those kids being married, dont think they want to spring it for quite a while yet. Sorry your nice weather caught cold but maybe it warm up again soon. Just so it doesnt snow. Billmeyer can spread the lime anytime and I sure hope it gets done this fall. The winter will be shortened quite a little by all the good weather you have had anyhow. Its a good day here cold but bright and clear, the sun porch is very pleasant with the sun beating in but stick your nose outside and it would be plenty nippy. The old mountains are getting more snow on them all the time and are bright & white.